Impressions: Choose ImpressionsI will make impressions and send back within 2 weeks. Please send me an impression kit (+$18)I have or will get impressions locally and send to you within 2 weeks. I do not need a kit. NOTE: This Product Requires Ear Impressions. A do-it-yourself impression kit is available as an option, or you can obtain ear impressions locally. Please View Instructions Before You Purchase This Product. Westone Model 47 high noise acoustic filter ear plugs are made specifically for hearing protection in a high noise environment where basic communication is necessary. 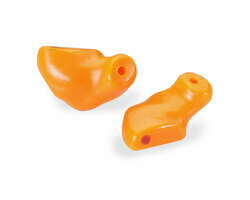 Westone Model 47 filtered earplugs are often used by heavy equipment operators, motor sports enthusiasts, construction workers, dental hygienists and shooters. 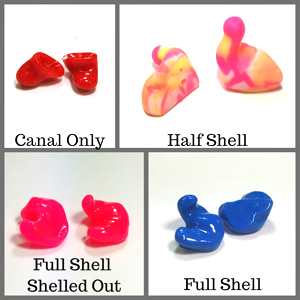 Westone Model 47 ear plugs are made of OtoBlast Silicone Material, and are provided with acoustic filters (NRR 21) and in a convertible option, with a pop plug cord that can be moved from the regular cord connection locations to form a stopper over the sound channel raising the NRR to 28. When you need less attenuation, simply move the pop plug connectors back to their fixed locations returning your Model 47 ear plugs to an NRR 21. The default form of the Model 47 is a thick half shell as shown above. You can also choose a different form if you prefer, at no additional charge. Crescendo Ear Balm formula with soothing aloe and other natural ingredients, significantly enhances the comfort of inserting, wearing, and removing custom and reusable ear plugs. Great for those new to hearing protection. Improves comfort and helps attain a good acoustic seal against noise. Oto-Ease by Westone makes inserting custom ear plugs, ear molds and other earpieces, including do it yourself ear plugs, easier and more comfortable. 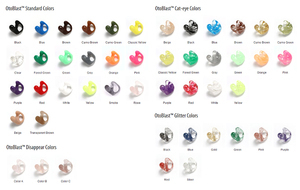 Designed specifically for use with full custom earpieces of all kinds and is sterile and unscented. 1/2oz bottle.